Quinces: Growing & Cooking is a book that every kitchen bookshelf should contain. Quinces have become an undeservedly forgotten fruit. This book reintroduces them to everyone, making them more accessible and providing an inviting range of recipes. The trees do not require much space, are easy to grow and would enhance any garden, whatever the size. The fruits are delicious and versatile and the recipes here extend well beyond jellies and jams, including sweets. From Goat's Cheese Tart to Quince Chocolates and Liqueurs, there is something for everyone.The quince has always had a special place among the fruits of Europe. The ancient Greeks called it the ‘golden apple’, the Romans the ‘honey apple’. And it was most likely a quince, not an apple, that Eve plucked from the tree in the Garden of Eden. This book describes both the cultivation, the history and the cooking of quinces. Useful sections set out how to choose the variety best suited to your garden, to plant the trees and to maintain them in good health; there is a sketch of the glorious history of the fruit in cookery of past ages; there are some excellent recipes for savoury dishes that depend on the quince for that special flavour, and for all those sweet dishes that bring out the unique qualities of the fruit.The authors ensure that the reader can keep their harvest in the proper manner and they spend much time describing those special quince confections such as quince preserve and quince ‘cheese’ (or membrillo as it is known to the Spanish).We tend to forget that the first marmalades were made from quinces and that before we had easy access to citrus fruit, the quince was perhaps the most flavourful and aromatic product of the orchard known to our forebears. Jane McMorland Hunter studied History at Edinburgh University. She has written a number of books including For the Love of an Orchard and two titles in the National Trust Kitchen Garden Cookbook Series. Sue Dunster studied Fine Art at Edinburgh University and then started her own silk screen printing business. She has a large organic garden with a small orchard including quince trees she planted over eighteen years ago. Review in the Independent 2nd November 2014 Emma Townshend: "Quince is almost impossible to buy and almost never eaten raw" In France, they call them les coings. Say it with a nasal Southern accent and it comes out almost like the sound of a duck's quack. At this time of year, you see them pinned with handwritten signs in beautiful round French cursive on the racks of good greengrocers and in village-square markets, golden-yellow and round, like the fast-disappearing sun. Here in Ye Olde England, though, we call them something much more Shakespearean, a name straight out of A Midsummer Night's Dream: the quince. Yet, even if you've often eaten quince jelly, that amber-coloured stuff the Spanish sell to go with manchego cheese, the likelihood is that you've never actually eaten a quince itself. Jane McMorland Hunter (rare bookseller and owner of a garden as neatly proportioned as herself) has set out with her colleague Sue Dunster to change this. 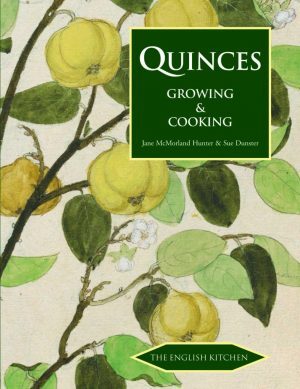 Their new book, Quinces: Growing & Cooking (£9.99, Prospect Books), is neatly proportioned, too, though like its authors, it spills forth a multitude of useful knowledge. Mainly with the object of getting us, the gardeners, to grow them at home, because, Hunter and Dunster cheerfully explain, "They're impossible to buy; even in season, they're usually only available at the more inspired farmers' markets." The weird thing about the quince is that they never get quite ripe enough to eat raw. They stay rock-hard, in most cases, and mouth-wincingly tart. This leads a lot of people with an existing quince tree to conclude that their precious acquisition is a useless example of the genre, and chop it down. This is a mistake for a couple of reasons. One is that quinces start the year by showing forth with a blossom so sweet and glorious that it's often treasured for purely floral reasons. And the so-called ornamental quinces (in a different genus, Chaenomeles) are covered, on bare, knobbly twigs, with apricot-coloured flowers with tiny, star-like centres, from late February onwards. But even if you're growing for taste alone, don't give a quince the chop based on its raw flavour. These hard, uninviting fruit need to be cooked to bring out their subtle, old-fashioned aroma, natural sugars and top-noted scent. And when I say "cooked", I mean cooked very slowly, to bring all that flavour out. It's worth it – it's likely that the Greeks meant quinces in their myths referring to "golden apples" (even starting the Trojan War on the way). Yep, that's how good quinces are – they are literally mythical. Quince trees, as Hunter and Dunster point out, won't fruit for a few years, so a three- or four-year old tree is the best to buy. Look for the right rootstock for your situation: Quince A will grow to around 15ft tall, whereas Quince C will stay measurably smaller (and is the one suitable for container-growing). The trees are self-fertile, meaning that you don't need another of a different variety to ensure pollination. Though they will need attention to get them going, once in full growth, quinces don't require much coddling – though they'd benefit from a yearly spring mulch, like any fruit tree. Then you just need to choose your recipe. This is where our quince enthusiasts really get going, offering 50 pages of ideas, gathered from around the world. There's a "camel driver's feast" dish, with quinces cooked with za'atar (Cool! Finally something to use up that jar you bought to make a single Ottolenghi dish); and a treacle tart variation made with a quince syrup. There are even "posh dodgers", sandwiched together with home-made quince jam. Don't mind if I do. See the first 29 pages as a PDF.